I watched the movie King Corn the other day. It's a documentary on the corn industry in the States. The film follows two recent college graduates who decide to grow an acre of corn and then follow it through the food supply. The movie's a fascinating look at a crop that's heavily subsidized and one that's responsible for one of the most celebrated nutritional boogey-men of the day - high fructose corn syrup (HFCS). The movie's both entertaining and informative and I highly recommend it. Some interesting facts I gleaned from the movie? You can grow 10,000lbs of corn on a single acre of farmland. Each strand of corn silk is actually attached to an individual kernel. The State of Iowa produces enough corn to supply the entire United States (2 trillion pounds of corn). 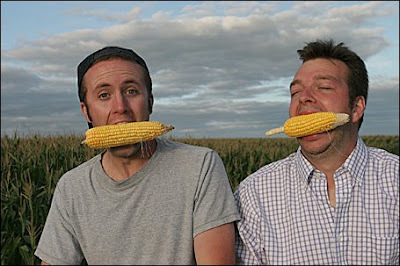 Most of the corn grown isn't edible (taste wise) without processing. While overall consumption of sugar in the US is down over the past 30 years by 30% more sweeteners are being consumed due to HFCS. Consuming one sugared soda per day doubles the risk of developing type 2 diabetes. Food's cheap - at the turn of the century we spent half of our income on food, today it's closer to 15%. "We subsidize the Happy meals, not the healthy ones"